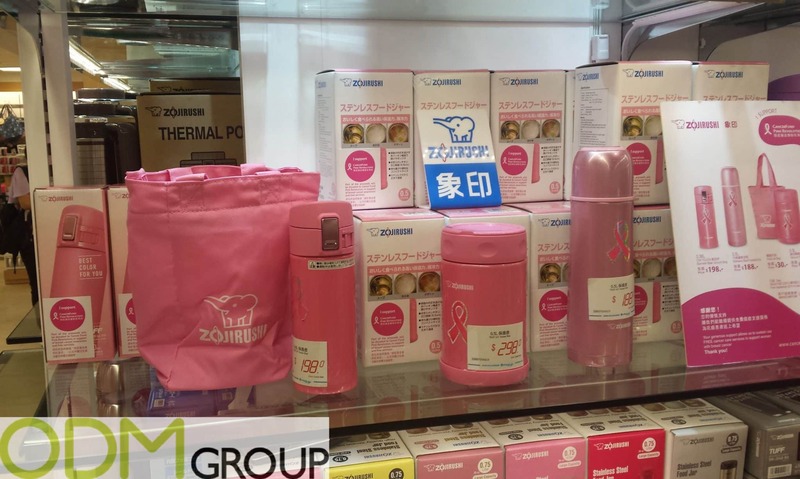 This branded thermal set displayed by Japanese multinational manufacturer and marketer of vacuum flasks, Zojirushi Corporation, is raising awareness for Breast Cancer Awareness in their pantone baby pink coloured thermal flasks as a major sponsor for the charity. These baby pink pantone coloured thermal flasks available in three different varieties, are designed to spread the awareness of the Hong Kong’s Cancer Fund Pink Revolution awareness. Each flask is designed to highlight the fund’s pink ribbon brand logo. For every purchase of each item in Zojirushi’s branded thermal set, a proceeding amount of money will be donated to breast cancer ‘Cancer Fund Pink Revolution’ Awareness charity to allow the sustainability of free cancer care services in support for Females with breast cancer. How does this branded thermal set promote charity awareness? By changing the design or packaging of the project it will help to spread your cause. When customers see the baby pink colour, they will automatically associate it with the colours of this Cancer Awareness charity. So therefore when they spot other cancer campaigns and products by this charity in the future they will remember the brand. Brand awareness. Using other brands products as a sponsor to highlight your brand and campaign is a great way to raise brand awareness about the causes that your charity or even company hope to achieve and spreads your brand value. Increased perceived value. If working together with a charity or an event campaign, customers will more likely purchase your product. The customer can personally be involved in your helping your aware making your brand and customer form a positive connection.Here at ODM we specialise in tailoring products that can be used in product promotions, and with a specialised design team ready to brainstorm and share ideas feel free to contact us with your ideas.